This special 50% off bundle contains two classic titles by H.G. Wells, the "Father of Modern Wargaming," his Little Wars (with an introduction by Gary Gygax) and Floor Games (with an introduction by James F. Dunnigan); the Little Orc Wars fantasy variant of Little Wars; Robert Louis Stevenson's exploration of wargaming Stevenson at Play; and the late great Steve Lortz's Quactica. H.G. Wells’ Little Orc Wars is a fun, simple, fast-paced system that is designed to be quick to learn and easy to play, so that players can focus on concerns like strategy and having fun, rather than on mechanics. It includes both basic rules that can be used alone, plus a variety of optional rules that players can add as they see fit to take their games to the next level. These include guidelines for Giants, War Beasts, Undead, Dwarves, Elves, Amphibious and Aquatic Creatures, Elementals, Structures, Siege, Terrain, Boats, and Heroes like Champions (Paladins, Rangers), Priests (Clerics, Necromancers), and Wizards. As their name suggests, the rules contained in this booklet are based on and inspired by the rules and concepts presented by genius writer and game designer H.G. 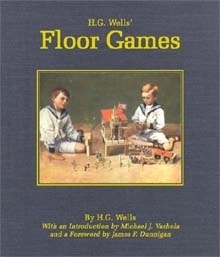 Wells in his works Floor Games (1911) and Little Wars (1913). 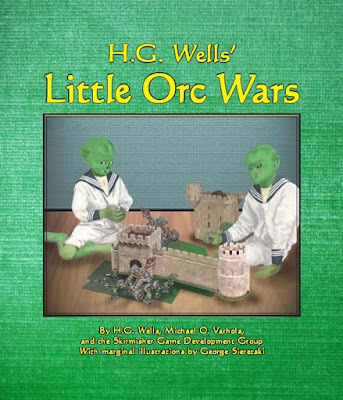 Little Orc Wars is inspired by them and is true to the spirit of Wells in every way possible — to include using live catapult fire to resolve ranged combat! A primary feature of this game is that it can be played with virtually any miniatures, setting it apart from games that demand only their branded products be used. It is, in fact, one of the most flexible, innovative, and fast-paced miniatures rule systems for use with fantasy miniatures and models ever created. These rules are also fully supported by d-Infinity Online game magazine, and players should keep an eye on it for addenda, errata, and optional rules and expansions for addenda, errata, and optional rules and expansions designed to incorporate more detail, options, and complexity. Originally written in 1913 by one of the greatest science fiction authors, this is a reprint of the book that gained H.G. Wells the title "Father of Modern Wargaming." Little Wars will appeal to science fiction fans, history buffs, students of politics and international affairs, wargamers, RPGers, and anyone else interested in the works of this great writer. Clear, authoritative, and entertaining text that reveals both the great mind and the sense of humor possessed by one of the world’s greatest science fiction authors. A complete miniatures wargame system that can be played as-is or used as the basis for other miniatures rules. Foreword by Gary Gygax, whose development of Chainmail and Dungeons & Dragons were influenced by H.G. Wells in general and by Little Wars in particular. Introduction by publisher Michael O. Varhola that discusses the relevance of this book both when it was originally published and now. Chapters titled "Of the Legendary Past," "The Beginnings of Modern Little Warfare," "The Rules," "The Battle of Hook’s Farm," "Extensions and Amplifications of Little Wars," and "Ending With a Sort of Challenge." Appendix on Kriegspiel that expands upon Little Wars and shows how it can be adapted into a military training tool. 20 black-and-white photographs, 19 of them from an original 1913 edition of Little Wars. More than 200 line drawings from the 1913 edition of the book, shown here in red just as they were in the original. Original illustrations for the Foreword and Introduction by artist George Sierestski. This download includes both low-resolution screen-friendly and high-resolution printer-friendly versions of both the book and its cover. Often referred to as a companion volume to H.G. 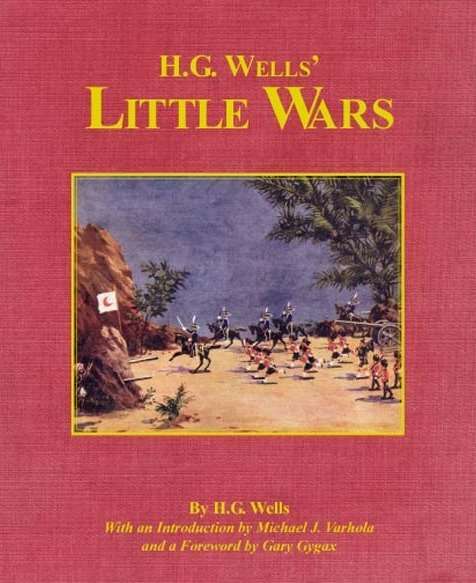 Wells’ wargaming classic Little Wars, Floor Games is a republication of the Father of Miniature Wargaming first volume devoted to recreational gaming. Highlights include a lighthearted, often humorous discussion on the theory and methodology behind a wide variety of "floor" and tabletop games and tips on the use and creation of improvised models, terrain, and other gaming props. Foreword by renowned game designer James Dunnigan — founder of game company SPI and magazine Strategy & Tactics and creator of such well-known classic wargames as Jutland, Panzerblitz, and Victory at Sea — that discusses Wells’ influence on the development of the modern wargame. Introduction by game designer and publisher Michael. 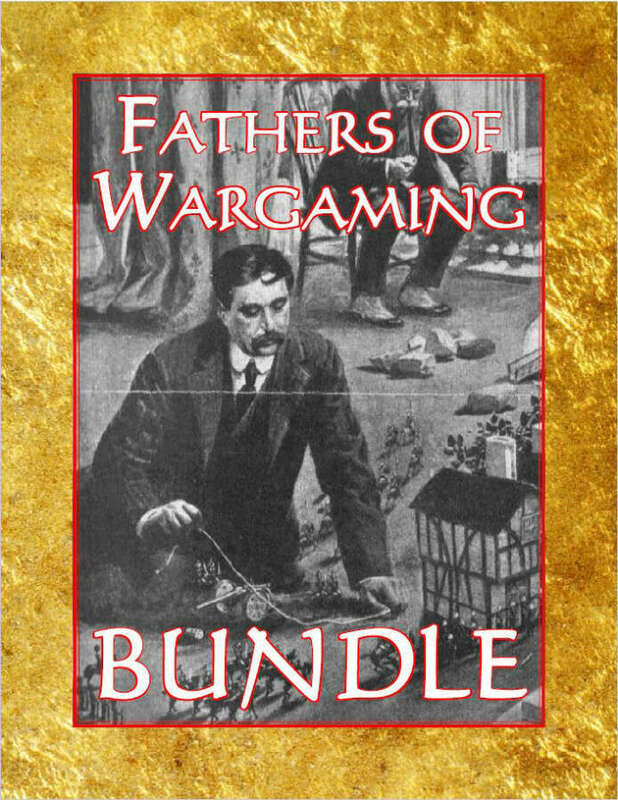 O. Varhola that discusses the first edition of this book, the special challenges related to republishing it, and its significance to modern wargames and role-playing games alike. Hundreds of pieces of the "marginal art" by J.R. Sinclair that illustrated the original 1911 edition of the book. Eight photographs taken for the original edition of the book showing the props and games created by Wells and his sons. 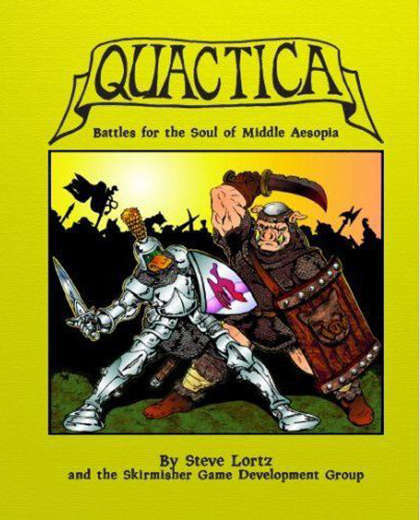 Quactica: Battles for the Soul of Middle Aesopia is an innovative set of miniatures rules by veteran game designer and miniatures sculptor Steve Lortz, author of the famous Perilous Encounters rules released by Chaosium in 1978. Set in a world inhabited by various races of anthropomorphic animals — including Ducks, Dwargs, and Porks — the Quactica rules tie in with a beautiful line of miniatures created by the late great Lortz and produced by Lance & Laser. This download includes a set of nine full-color miniatures that can be printed out either in color or black-and-white on cardstock; Quactica statistics for four different skill levels of Loonar Imperial Heavy Infantry and Loonar Imperial Archers on the one side and Pork Warriors, Gobbling Warriors, and Gobbling Archers on the other; and full instructions for assembling them. This book is part of a thematic series of works on miniatures wargaming published by Skirmisher that includes the H.G. Wells books Little Wars and Floor Games, and the company’s spinoff Little Orc Wars. Famous as the author of such great works of literature as Treasure Island, Kidnapped, and Strange Case of Dr. Jekyll and Mr. Hyde, Robert Louis Stevenson was also a dedicated war gamer. 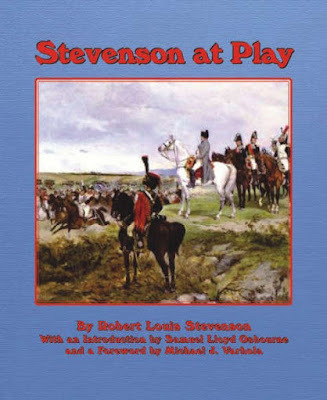 Stevenson at Play, one of the lesser-known works of this “Grandfather of Modern Wargaming,” describes a complex strategic wargame that the author and his stepson, Samuel Lloyd Osbourne, played in the early 1880s. Skirmisher’s edition of Stevenson at Play includes an Introduction by Osbourne, a Foreword by publisher and wargame designer Michael O. Varhola, and several period pieces of art, including some hand-drawn sketches by Stevenson himself. This download includes low-resolution screen-friendly and high-resolution printer-friendly versions of both its interior pages and cover surfaces. This book is part of a thematic series of works on miniatures wargaming published by Skirmisher that includes the H.G. Wells books Little Wars and Floor Games, the company’s spinoff Little Orc Wars rules, and the Quactica miniatures rules.